You’ve tried “clinical-strength” antiperspirant, wadding up paper towels or maybe even graduated to armpit pads. But nothing seems to stop that pesky underarm sweat. If you suffer from hyperhidrosis, you may have considered more serious treatments like oral medications. But the idea of taking prescription drugs for hyperhidrosis might leave you with some serious questions and concerns. Are they safe to take? And how do you know if they work for you? Through our experience, research and customer feedback, we’ve compiled some things you need to know about taking drugs for hyperhidrosis. Known as anticholinergics, this class of drugs block certain neurotransmitters to treat asthma, incontinence, depression, COPD and other gastrointestinal issues. Because of their drying effect, they've also been shown to reduce sweating. Robinul (also known as glycopyrrolate) is a common oral anticholinergic designed to relieve stomach pain associated with peptic ulcers. Like other anticholinergics, Robinul also suppresses sweat glands across the body. Although anticholinergics haven’t been studied in clinical trials for hyperhidrosis, they’re still used to treat excessive sweating. Learn more ways to stop sweating. Because their use is off-label, it’s important to understand potential side effects and limitations of prescription drugs for hyperhidrosis. The most common reaction tends to be dry mouth, which may be palatable for some people. Drowsiness, headaches, blurred vision, dry eyes, heart palpitations and constipation can also occur. Of course, the severity of these reactions will vary from person to person. It’s recommended to stay hydrated, avoid alcohol and increase your fiber intake to help subdue dry mouth and constipation. Drug interactions may change how your medications work or increase your risk for serious side effects. Glycopyrrolate (a popular anticholinergic used to treat hyperhidrosis) could affect the absorption of other medications like anti-fungal drugs and those that also cause dry mouth and constipation or are affected by slow gut movement. To avoid allergic reactions and more serious side effects, be sure to disclose any allergies, medical history and if you’re pregnant or breast feeding when talking to your doctor or pharmacist. Anticholinergics reduce (and sometimes completely stop) sweating across the body. In turn, this affects your ability to cool down. When taking these medications, hot temperatures and increased physical exertion make you more likely to overheat, so make sure to watch for signs of dizziness, pale skin, headache, nausea and/or muscle cramping that could signal heat stroke. Also avoid activities that may cause you to overheat, such as strenuous work or exercise in hot weather and hot tubs. When exposed to heat, make sure to drink lots of fluids and dress lightly. For older adults who already experience drowsiness, confusion, unusual excitement, constipation and urination problems, taking anticholinergics can intensify these reactions. Who Do Drugs for Hyperhidrosis Work For? While anticholinergics like Robinul can stop sweating, they’re not for everyone. Because they subdue sweating across the body (not just the underarms), the drying effects isn't always consistent. For example, the medication could completely stop hand and feet sweating and only slightly reduce armpit sweating. Because drugs for hyperhidrosis also put you at risk for heat stroke, athletes and people who exercise heavily on a regular basis may not be good candidates. If you take medications that could interfere or conflict with anticholinergics, you should not take take them for hyperhidrosis. Talk to your doctor to learn if anticholinergics are a safe option for you. If you’re looking for another line of defense against underarm sweating, Thompson Tees can help. 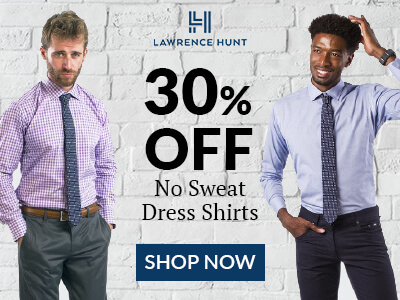 Our undershirts contain patented underarm barriers that completely block sweat from passing through — preserving your clothes and your confidence.